Want to be involved? Fill out this form to stay informed! Want to know more about AI topics at VUB? Click here. 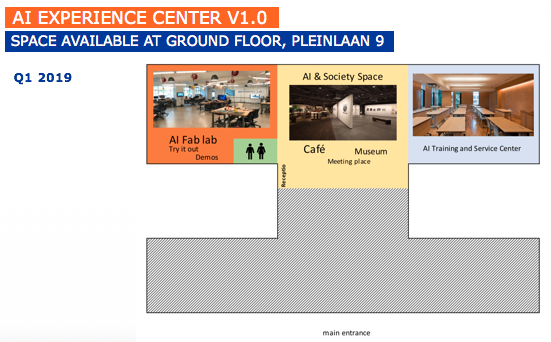 The AI Fab Lab is a joint project of the Artificial Intelligence Lab, Brubotics and the SMIT research group, all located on the VUB campus. It is a high-tech playground where companies, tech entrepreneurs, researchers, policy makers and the general public can experiment with AI and collaborate to develop and produce local technological solutions to local problems. It is our ambition to extend this AI Fab Lab into a full-fledged AI Experience Center together with partners such as IMEC, the internationally leading institute for digital innovation. Its purpose is to be a world-renowned hub for artificial intelligence, opening up the unique opportunities of AI and robotics to companies, startups, non-profits and other universities and knowledge centers. VUB, with its worldwide recognised heritage in AI since 1983, its strong interdisciplinary tradition, its central location in Belgium and Europe, and its close ties with global economic players as well as the Flanders Innovation ecosystem is uniquely positioned to make the first AI Experience Center of its kind a success. We are now inviting companies and research groups to join this unique initiative and become a part of this new AI ecosystem. There are multiple ways to support the AI Experience Center: become structural partner of the joint R&D programme on Human AI, set up a specific innovation track with us and/or provide open infrastructure. In return, you become part of the R&D and innovation ecosystem curated by VUB and IMEC, get hands-on support for your AI innovation and strategy, find business partners, attend seminars and training sessions, increase your visibility, and have access to new AI and robotics talent. For more information, feel free to contact Leander Schietgat (AI Lab), Ann Nowé (AI Lab) or Pieter Ballon (SMIT).